If you play PlayerUnknown’s Battlegrounds anything like I do, you’ll know that snipers are important, but probably not how to actually use them. 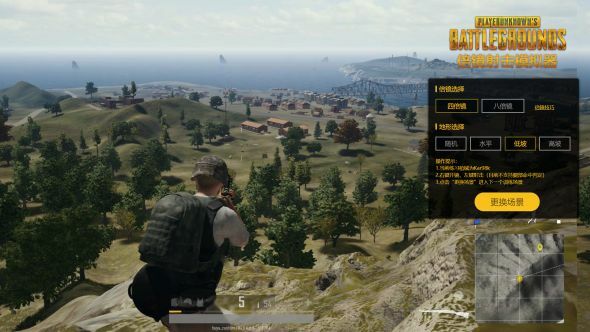 To help you out, a Chinese player has developed a simulator to help you calculate PUBG bullet drop. If you need more help, check out our PUBG guide. The simple program appears to use in-game assets, and gives players control of a Kar98K sniper rifle. You’ll be placed in one of a random selection of positions on one of PUBG’s maps, with another player somewhere in your eye-line. Right-clicking on the screen brings up either a 4x or 8x scope, and you have to try to hit the stationary player, accounting for the rate at which bullets drop when fired over long distances. Only one gun is currently available, and the 2x and rare 15x scopes are also missing. Distance between the two characters seems to be randomised, but you can edit some aspects of terrain, allowing you to choose between open plains, and being on a hill either above or below your opponent. Once you’ve taken your shot, the game will tell you whether you’ve missed, hit the other player’s body, or scored a headshot, as well as how far away your target is. The simulation is currently all in Chinese, but google will automatically offer to translate the simulation (which is entirely in-browser), making the whole process a lot easier to understand. While testing it out I did find some long load times, but everything seems to be running smoothly now. This isn’t the first time someone has made something like this – Battle Royale Trainer is a paid game on Steam that lets you practice PUBG without the inconvenience of other players.